The links below are where you go, to get them both. But really only if you need these new features. Or if you have a circumstance or problem where Supermicro 24-Hour SuperServer Technical Support has directed you perform an upgrade. See also warnings, pictured. 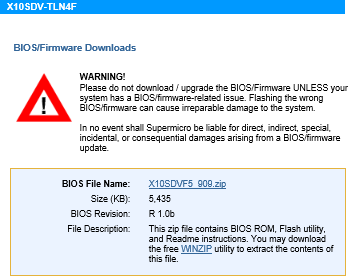 I've heard from Supermicro support that bootable M.2 and NVMe support is what's been added to the BIOS. I don't know what's changed in IPMI, and I can't say I noticed any obvious UI changes or functionality differences. I did these 2 upgrades to 3 5028D-TN4T systems, and it all went fine. Your results may vary. Unfortunately, the video I had of most of the procedure didn't work out. Since resolved, video below! Thanks to a temporary loaner 2nd SuperServer by @xenappblog. If you own this motherboard and you're thinking about M.2 and/or NVMe bootability, thought you might want to know these new upgrades have quietly arrived. 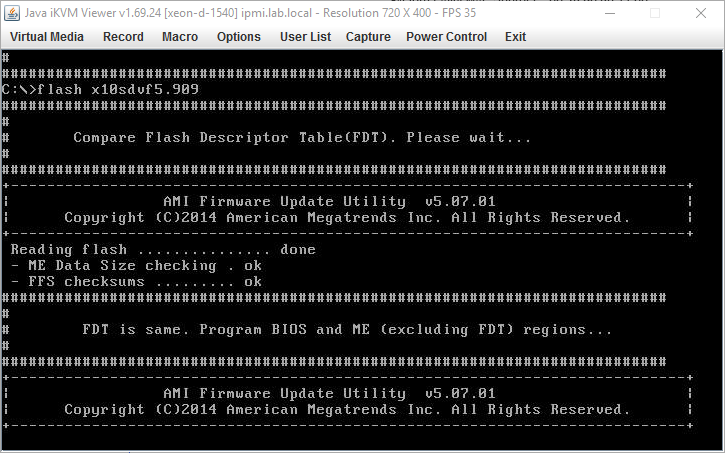 Next, click on the "Update Your BIOS" and "IPMI Firmware" links to download. Copy all the files from the extracted download onto the root directory of that same USB drive. Properly eject the USB drive using the taskbar Safely Remove... icon. If your BIOS is set to UEFI, you may have an issue booting DOS from this media, simply power up, press Del to get into the BIOS setup, and change to Dual mode instead, then boot DOS from the USB flash drive. Wait until it's done, takes about 5 minutes. Enter the BIOS again, switch back to UEFI mode. About 5 minutes later, BIOS flashing completed. Under Maintenance, Firmware Update, select the "Enter Update Mode" button and follow the instructions, using the IPMI file downloaded, making sure to uncheck both boxes when prompted to preserve your configuration. Curious why? It's all explained in more detail below. 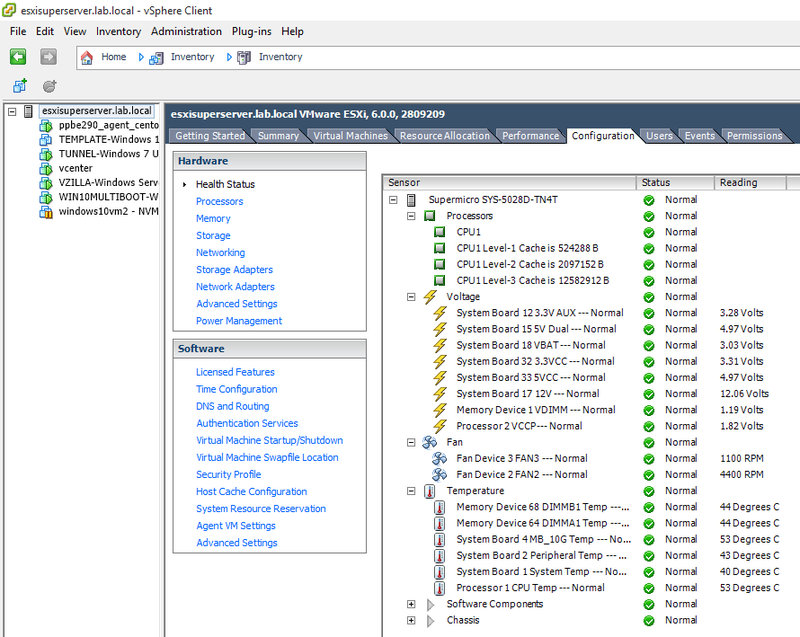 1.19 voltage alerts in VMware vCenter - RESOLVED! 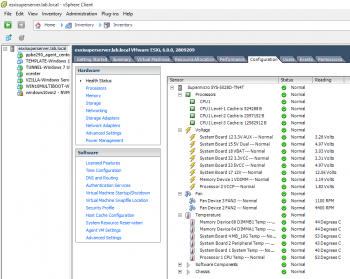 Under VMware's vSphere 6.0 / ESXi 6.0, right through Update 1, you may get low voltage warnings for your DIMMs, under vSphere Client or vSphere Web Client server Health views. Even when I temporarily had access to 3 identical SYS-5028D-TN4T servers, moving the DIMMs around didn't help. Never a problem under Windows 10, only a possible problem under ESXi. The yellow visual warning for DIMM voltage, with everything else green was annoying. What if the voltage still would read the average of 1.19, but show green instead (seen pictured at right)? FYI Supermicro support assured me is voltage is within normal range, and nothing to worry about for this mobo/DIMM combo, under case # SM1506265679. So it's just a VMware UI annoyance. Yes, I said was, this can be fixed. With the help of TinkerTry site visitor Derek Trower who found himself in a similar predicament, it seems likely this tip (below) that he shared will help you see green again. Any such upgrades are at your own risk. 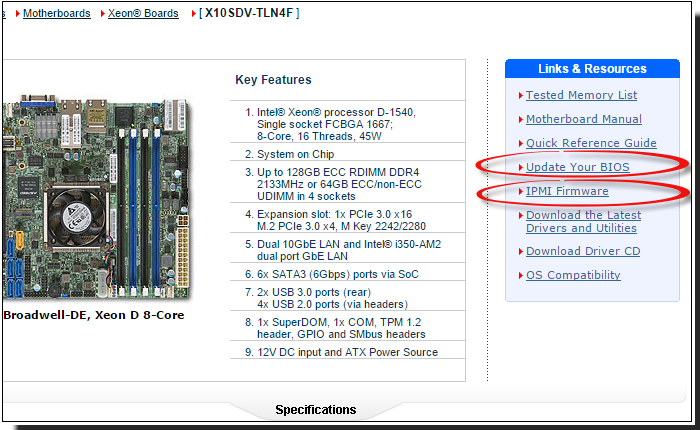 You'll need read this entire section, which prepares you to upgrade your BIOS and IPMI properly. Again, there is always a risk when doing such work, and you'll want to be sure your SuperServer is plugged into a UPS, such as the CyberPower PFCLCD series. NOTE !!! Uncheck preserve configuration box during flashing (very important step for FW to work properly). All settings will be reset to default. Key point is to uncheck both boxes, readme only shows 1, after the firmware upload for the preserve configuration settings. I also had the server shutdown when I updated the IPMI firmware using the web interface. I don't think that had any effect but I wanted to isolate everything I could to get it fixed. 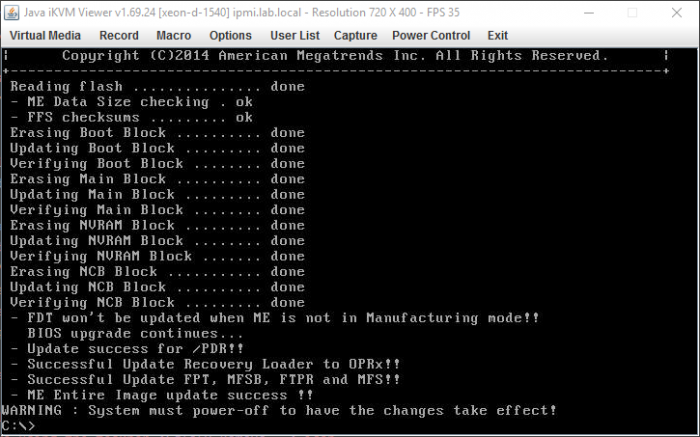 Power back on, and reconfigure your IPMI settings appropriately. I may have an opportunity to record video of this entire process on a factory-new 5028D-TN4T in late October 2015, assuming it arrives at 1.0a. I'll then be able to verify that this exact procedure. It happened, with video published above! Apparently the option to turn on SR-IOV in the BIOS is removed, when you move from 1.0a to 1.0b. One could guess it didn't work quite right, from the comments here, with the scoop on the whole matter at ServeTheHome here. It appears Intel told the wrong information to vendors in their March 2015 press releases.